In our analysis of 21 January (LINK) we had made evident that there must be strategic limits to the corruptions of the Italian political-institutional system, and also that one of those limits is the immediate re-establishment of the correct administration and roles of the present-day Free Territory of Trieste and of its international Free Port for the economic stabilization of both South-Eastern Europe and of the area of former Yugoslavia. This strategic limit has been crossed on 26 January by the Commissar of the Italian Government in Trieste, Francesca Adelaide Garufi, who, in spite of the documented formal notices she received, ceded to the pressing of Italian politicians and speculators by signing, during the last days of her office, an illegitimate decree to eliminate a whole sector of the international Free Port of Trieste, the Northern Free Port. Since this operation constitutes an international fraud, the illegitimate decree of Commissar Garufi becomes the ultimate evidence of a new Italian scandal that will have immediate effects, both in respect to the civil and criminal liabilities it gives raise to for the Italian public servants who made themselves responsible for that, and in respect to the international responsibilities of the Italian Government, entrusted with the temporary civil administration of the present-day Free Territory of Trieste. The Free Trieste Movement – FTM has already presented criminal complaints against those responsible of such serious crimes, and the International Provisional Representative of the Free Territory of Trieste – I.P.R. F.T.T. is arranging the opening of an international dispute in accordance with the specific norms of the Treaty of Peace with Italy of 10 February 1947. The detailed analysis of the illegitimate decree will be published with the documents of the legal and international actions of both the FTM and the I.P.R. F.T.T., but we can already anticipate a synthesis that is suitable to understand the exact nature and seriousness of the facts. First of all, it is important being aware of four things: the Northern Free Port is bound by law to this use; that the area is necessary for the fast development of the international Free Port of Trieste; that in both 2003 and 2009 an excellent and still current project has been presented for this purpose; that the current abandonment of the area is not natural but artificial, since it has been imposed to justify its elimination with a series of frauds that have now culminated in the illegal decree of the Commissar of the Italian Government. The decree – which contains numerous mistakes and pass been deliberately written imprecisely and confusedly to hide the fraud – states that the legal regime of free port is moved away from the Northern Free Port (they call it the “old port”) to new areas, upon a proposal of the Port Authority which has the purpose to extend to said new areas the port, industrial and logistic activities of the free port. The fraud consists in the construction of the text to make it seem that in order to extend the regime of international Free Port of Trieste to new areas it is necessary and legal to remove it from a constrained area. Both claims are absolutely false. The truth is that the specific provisions of international law concerning the legal system of the present-day Free Territory of Trieste, which are also implemented in the Italian legal system, allow to extend the free port regime to new areas, however, do not allow to change the status of constrained areas, such as the Northern Free Port. Said provisions cannot be amended by the provisional Government entrusted with mere temporary civil administration, not by its Commissar in Trieste, and not even with laws of the State of Italy (which would also constitute breaches of articles 10 and 117 of the Constitution of the Republic of Italy). To complete the fraud, the text of the decree recalls the provisions of international and Italian law which prohibit to remove the Free Port regime from the constrained areas, but does refer to them only in general and incomplete terms, making it seem like they would allow it. So, the main responsible of the illegal decree constructed on false statements are two functionaries of the Italian Government, entrusted with the mandate to exercise temporary civil administration over the Free Territory of Trieste: the Commissar of the Port Authority of Trieste, Zeno D’Agostino, who requested it, and the Commissar of the Italian Government in Trieste, Francesca Adelaide Garufi, who issued it. We can also prove that both Italian functionaries acted being aware that their actions constituted breaches of international law, of the legal system of the Free Territory and Italian laws. The civil and criminal liabilities of both functionaries are therefore very serious, and even if, by now, Ms. Garufi has retired, D’Agostino should be removed from his office. But their actions are by now directly involving also the responsibilities of the provisional Italian Government, because they acted on its behalf, and the new Commissar of the Government, Annapaola Porzio. Because if neither the Italian Government or its new Commissar in Trieste suspend or declare null and void the decree, they would both by guilty of breach of the international mandate of temporary civil administration over the present-day Free Territory of Trieste on behalf of the United Nations, but also of the damages caused to the Free Territory and to all other States that have general and special rights over the international Free Port. In reality, Garufi and D’Agostino act on their own, but at the initiative and under the pressing of the transversal consociation of Italian politicians and speculators who organized the fraud, influence local press and are well aware that the operation is illegal. This consociation is capable of influencing public servants to the point of having them committing crimes, and since 2012 it is lead by some heads of the party to which belongs Italian prime minister Renzi, the PD. The most aggressive of them are four: Debora Serracchiani, national deputy secretary of the PD and president of Region Friuli Venezia Giulia; Ettore Rosato, deputy and leader of the PD at the Chamber; Francesco Russo, PD senator and author of a deceptive law that favors the fraud at the expenses of the Northern Free Port; Roberto Cosolini, PD mayor of Trieste. The operation is also supported from the outside by some center-right defectors like former mayor Roberto Dipiazza and former deputy and vice-minister Vittorio Sgarbi. 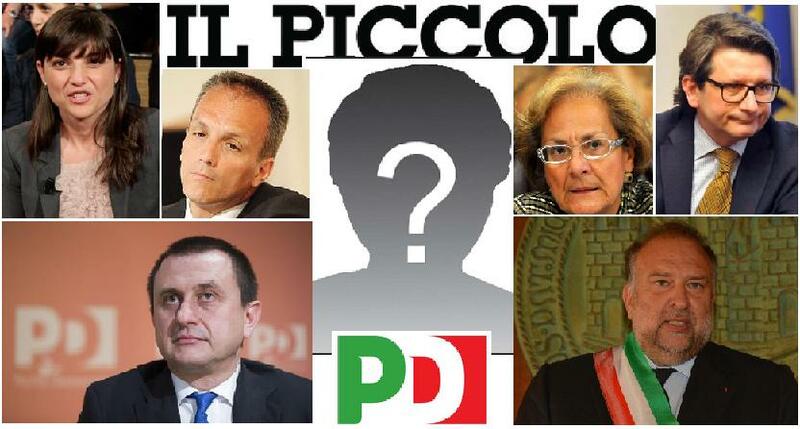 Those four heads of the PD are the same who, with local newspaper Il Piccolo (gruppo Espresso) have subject Commissar Garufi to extreme pressing to force her to sign the illegitimate decree before retiring. And, since they succeeded, it is possible assuming that the pressing was accompanied also with promises of political-legal covers (according to certain sources, Serracchiani has received the support of premierRenzi) for her, and probably for D’Agostino as well. In facts, they are also the same representatives of the PD who, using the same newspaper, lynch-mobbed the president of the Port Authority Marina Monassi because she defended the Free Port, forced the Italian Minister Lupi to not renew her mandate and had him ordering the compulsory administration of the body, signing the role of Commissar to Zeno D’Agostino, their own choice, who declared himself to be ready to support the illegal operation on the Northern Free Port. As he did. The criminal liabilities of public servants are more relevant than those of private citizens, however, Garufi and D’Agostino are not the only two who made themselves responsible of the fraud. Because public servants are also the president of the Region, the mayors, the assessors, regional and city councilors, certain magistrates who did support the fraud with deceptive judgments, or who blocked the criminal complaints and investigations, as well as all other public officers who had the legal duty to prevent this fraud but let it happen. The operation is also subject to documented anti-mafia questions (in Italian, LINK) to which the Italian politicians and functionaries involved (among them, Rosato and Sgarbi) are since years refusing to answer and on which Italian magistracy does not seem willing to investigate, while Italian media maintains an unnatural silence on the fraud at the expenses of the Northern Free Port. And confidential investigative sources say that this is only the visible edge of the iceberg. This means, since time, there are investigative evidences that the international fraud at the expenses of the Northern Free Port of Trieste is not a collection of random facts, but the action of a network of traversal power that is organized following the typical models of the system of corruption of Italian politics and institutions, which, as for this case, has special economic and strategic goals that are incredibly dangerous not only for Trieste, but for the whole region of Eastern Adriatic. The main illegal economic and strategic goal is to divert from Trieste and, consequently, from the neighboring ports of Koper and Rijeka, to the ports of the Italian peninsula, especially to those under the strictest control of organized criminality (Naples, Gioia Tauro, Taranto, Bari), the enormous traffics expected on the Baltic-Adriatic route. This diversion would suffocate Trieste and delay the political-economic stabilization of North-Western Balkans. The second illegal goal is to inflate the real estate market in Trieste by announcing the sale of the land and buildings of the Northern Free Port, which would cause a fall in the value of real estates. A fall that would cause the bankrupt of dozens of thousand of small private owners and the properties of public bodies, allowing massive housing and building speculations. In which Italian mafias could launder billions of Euro. On the other side, the explosion of this new scandal of political-institutional Italian corruption has also two positive aspects: it can allow to make a clean sweep, and it makes it even more urgent to consolidate the independent role of the present-day Free Territory of Trieste and of its international Free Port as a factor for the economic stabilization of South-Eastern Europe in the Euro-Atlantic frame.